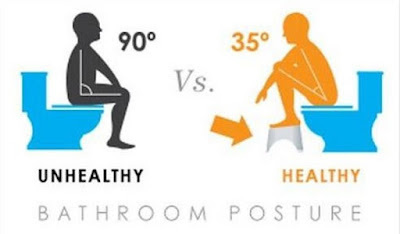 Home health health news Toilet useful The Correct Way Of Sitting On Toilet. You’ve Been Doing It Wrong Your Whole Life! The Correct Way Of Sitting On Toilet. You’ve Been Doing It Wrong Your Whole Life! You probably never thought this could be a problem, but how do you actually sit on the toilet? In the 90-degree position (the angle at which your hips are bent), the natural passage of your intestines is disrupted and literally sealed off. Only through unnecessary exertion against the laws of physics can you manage to complete the “movement.” In the worst case, this can lead to constipation, irritable bowels, hemorrhoids, and even colon cancer. The so-called 35-degree position is completely different; here everything can take its natural course. This position is the normal in the wilderness and among many cultures, and is learned from infancy on. Somehow the Western world was convinced that sitting is more civilized. According to Dr. Mercola: “The scientific benefits of squatting have sparked efforts to design devices that help would-be squatters to return to a more natural pooping position […] Another advantage of squatting? Killer thighs. Nothing builds your thighs like a squat. Adding some squats at the gym will undoubtedly help you with your squats in the bathroom!” Since it’s impractical to convert all of our toilets to make them the right height, a simple solution would be to just put the feet up on a stool (or a box) while taking care of business. Try it out yourself!